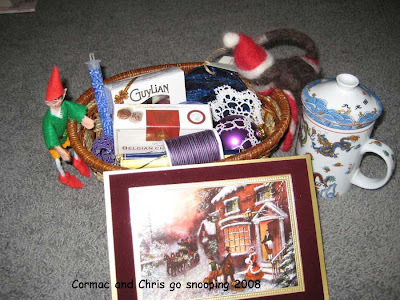 Just thought I would show you what I sent to Connie Angeline in Gina's tatting Goddess Secret Santa exchange. It's a wonderful way to make new friends and to get a little bit of someone else tatting to drool over..that is a joy forever. I hope Connie enjoys all my gifts and much as I am enjoying mine from Ellen. I know that she likes her leprechaun! Here are some I made earlier!!! It's almost New Years Eve...all the family are here, both our children and other halves! and Baby Fionn...so all heck has been let loose....Fionn has grown so much (2 months old now) and is such a good natured baby that he can be forgiven when he cries. 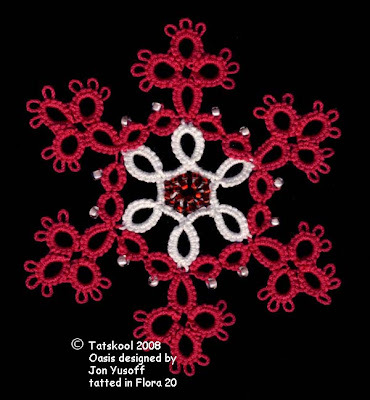 Back to 2007 when I was too busy showing you animals for my challenge to show you snowflakes. 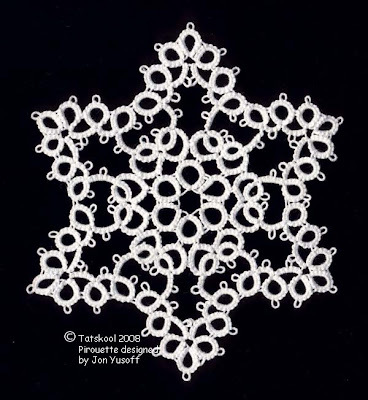 I decided to take one or two patterns and see what could be developed from them from simple to complex. I'll show you one of these. 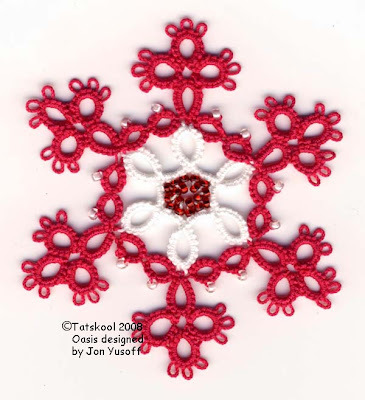 This was a pattern from Rozella Linden's book 'Easy Tatting'. I gradually added beads from 6 to 12 to 24...and then mounted the last one in a sparkly ring matching the beads. 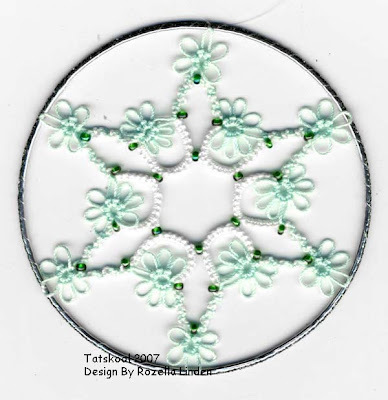 Then I used a varig Altin basak thread and finally tatted it in pale blue and white using flipped and unflipped stitches ( the name of this escapes me at the moment! )in the outer chains. 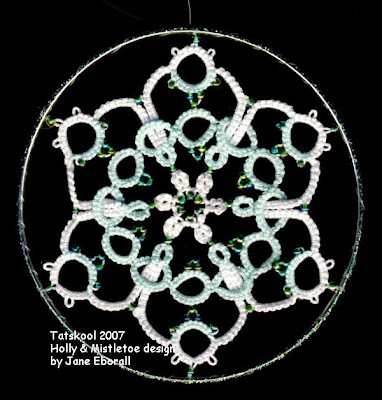 Two more actually made it to the tree and not the display sheet, mounted in toning sparkly rings. 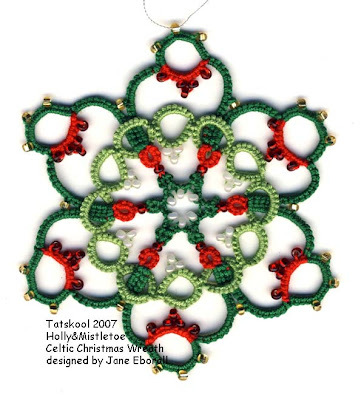 I also played with Jane Eborall's Holly and Mistletoe Celtic Wreath pattern. this one in different colours.. These two did both make it to my tree this year. 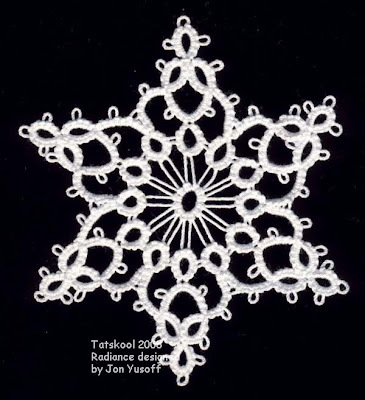 New off the shuttle is this little beauty from the Oasis pattern of Jon's. 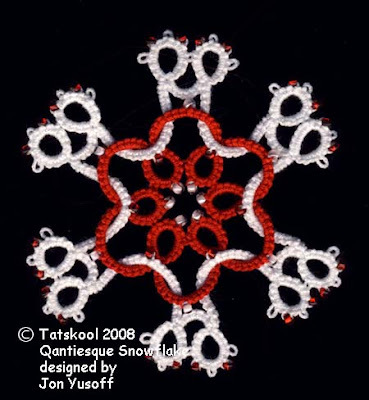 Isn't that stunning, silver lined red beads on the white thread and white lined clear beads on the red thread. All threads are Flora 20. When I picked this thread up in the dark I thought it was red but it's actually more of a fuchsia colour. 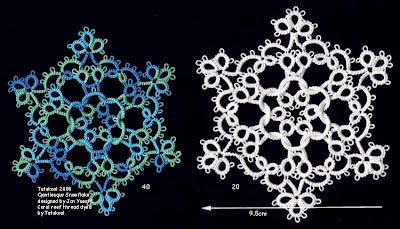 Back to Jon's Quantiesque snowflake. In real life it looks amazing, sparkles catch the light. This is my favorite of my Qantiesques. Again Flora 20 and the same beads as in Oasis. 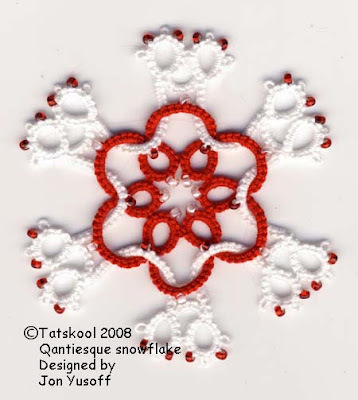 I promised that I would try to tat some of Jon's snowflakes in different colours and with beads. I have not got very far and time is running out before I must start something new. 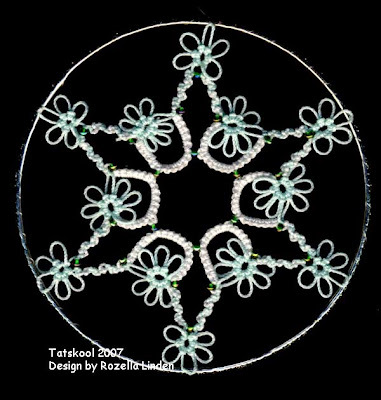 second was The Twirly....... with silver lined light green beads. Now don't they look different. I was not too sure that I liked either of these until they were finished.. I guess I am stuck in a Rainbow rut! My Secret Santa partners this year were Ellen Lai and Connie Angeline. 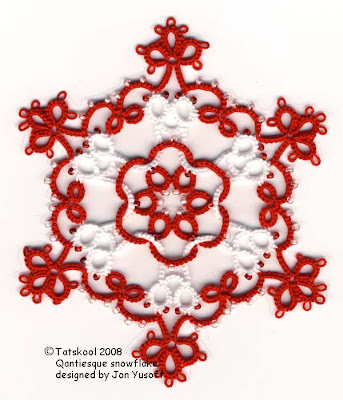 This is my favorite and only exchange and is run by Gina for the Tatting Goddess group...thanks Gina. When my package arrived from Singapore I had a fair idea who it was from and hoped that there would be one of Ellen's own designs inside....there were in fact 3. 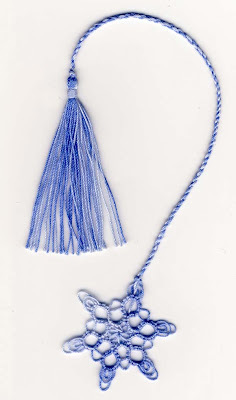 A lovely shimmering angel tatted with 3 out of 6 strands of DMC Mouline pearlescent effect thread, a gorgeous Christmas tree bookmark..the one I had been hoping for (now I have to have a go at making this one)and a delicate varig' blue snowflake bookmark, in Manuela 20. It's almost impossible to show you the effect of the irridescence. 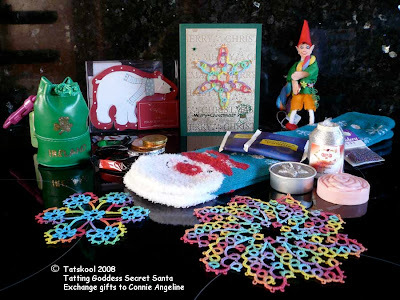 Lots and lots more goodies packed in a lovely Hello Kitty tin, 3 balls of Venus perle thread...I have never tried this, bangles, cabone rings, rose beads...angel wing beads...ooh they are lovely...please show me how to use these. 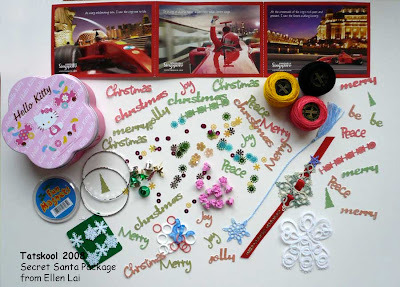 A blank fridge magnet to fill,and lots of stuff for card making...I guess she knew that I make cards...little bells, snowflakes,Xmas tree brads and a huge lot of Christmas greetings that she cut out with her QuicKutz die cutter...I want one of those!! 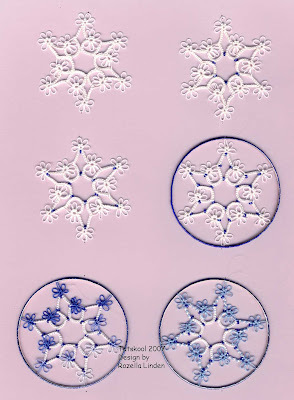 I got a glass cutting mat and oval shape cutter set for Xmas to have fun with, these will be perfect for my ovals. I will certainly use all of your gifts Ellen, thank you so much...your package was a joy to open. Oh! and there were sequins sprinkled everywhere. Lovely stuff! 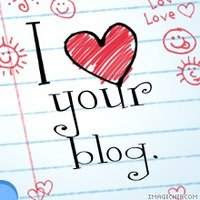 Leps get their own blog!! 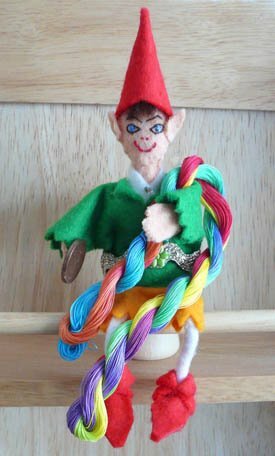 All you non leprechaun lovers need groan no more.....the leprechauns have got their very own blog........set up by Oisin and Laura...who did a great job....thanks you guys. 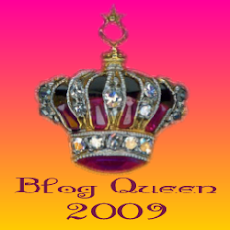 My last post is there to start it off...you can check it out at.... 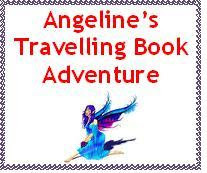 It's A Leprechaun's Life and you can find it anytime and see when it has been updated on my blog roll in the side bar. All the leps will be invited to join and show what they are up to. It's a Leprechauns life! Part 1. If there are any of my readers who aren't Stark Staring Bonkers...........they should not read on!! Ok! 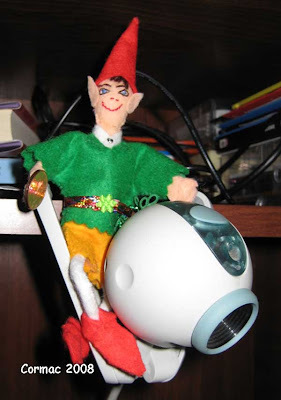 so the rest of you know that Leprechauns set off from Ireland before Christmas to colonise more of the world. You may not realise that there were 6 and not 5 that left home. Note!! You may have already seen most of this elsewhere but this is the collected edition! First to arrive was Danny. Danny travelled to North Carolina and spent a short while still confined in his packing, until his new mum was told that whatever was in there might need some air....then he was released and not a moment too soon, as Martha said he was lucky that the post had been running ahead of schedule so he had plenty of oxygen left. Once Danny was released he was Leprechaun with a mission and he headed straight for Martha's stash to reconnoitre. He hasn't been heard off since so lets hope he didn't fall in and couldn't get out. I am sure we all hope that he had a Happy Christmas in his new home. Next to arrive was Killian ( I think) who travelled to Illinois. 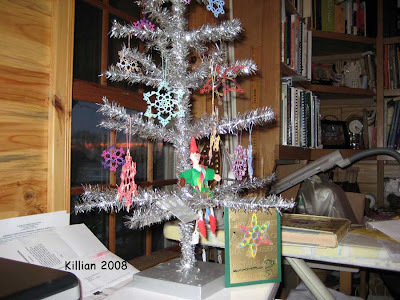 He was straight out of the bag and on to Diane's tatting loaded tree top check it out....and keep an eye on her...Killian also need to get his pointy shoes set firmly on the ground! he did a good job and managed to get Diane to leave what she was doing and tat. Killian has been veery quiet since..he must be up to something, hope he enjoyed Christmas. 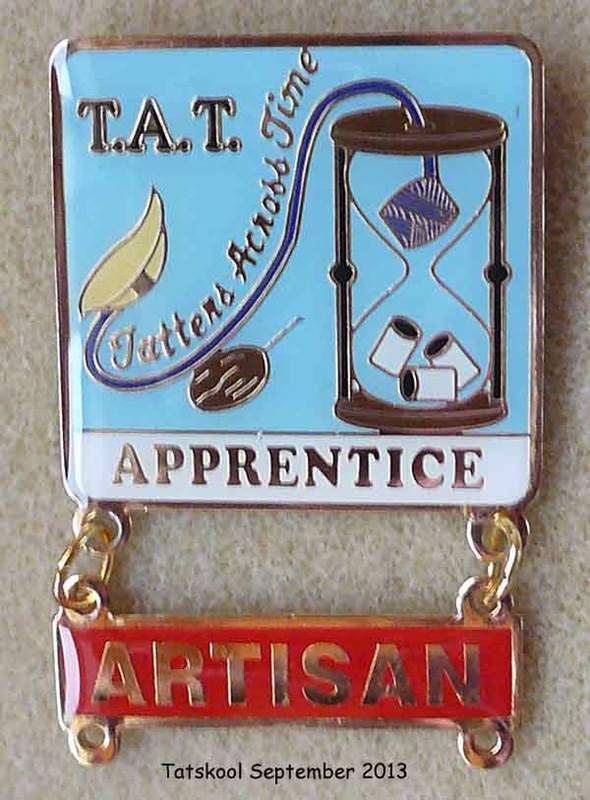 You may not realise that all these leprechauns are tat trained so they know what it's all about. Where did they learn??? at tat-skool of course!! The most common complaint that is coming through is that the ******** lucky cent is a ********nuisance and is stopping them, from fulfilling themselves!! To be honest I never imagined what an active life these little fellas were going to have...I thought they were just going to sit quietly and be lucky!! 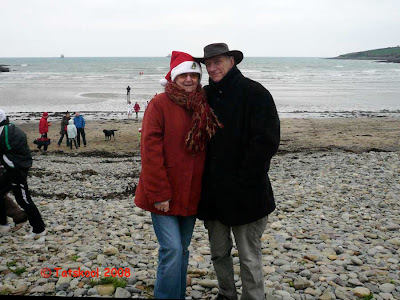 In fact my Fergal is asking for a coinotomy..so we shall have to see and maybe future leps will not have such a hindrance. Cormac arrived in Indiana but had to wait on the doorstep until Gina got home....late! !, luckily some kind person had put him into a plastic bag so at least he didn't get wet..only very cold...so he says!! He say up on her webcam and told her all about his old home....mmmmm! thought they had been programmed not to tell...maybe he told fairy tales!! 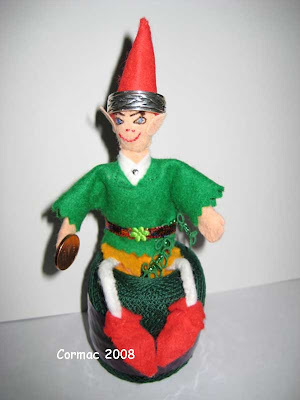 Then didn't he find a ball of green thread and a Celtic Ring that made a perfect crown. Gina found that in a parking garage and no one claimed it, she intends/intended to give it to her son who loved his visit to Ireland....think again Gina!!! 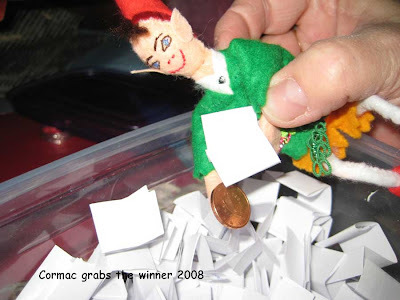 Cormac already has both feet firmly on the ground and was put to work drawing the winner of Gina's Anniversary blog prize for December. 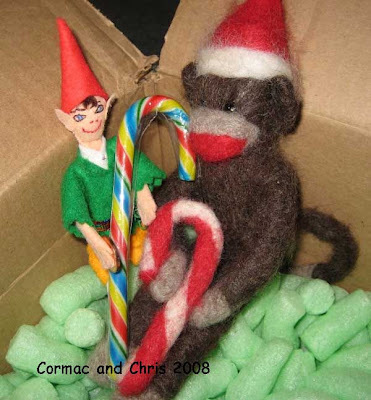 Cormac has found a friend in Gina's Chris Sockmonkey and they are hanging out in a box of green peanuts...does she think this is what he Cormac eats..oh no obviously not as she has given him a Rainbow candy cane...I am not sure that he eats Rainbows either!! She did catch them snooping into her Secret Santa box from Melissa J...he is only doing his job Gina!! Better stop here before you get too tired and go and photograph my Secret Santa package....Will catch up on the other leps another day. they are all such busy bees. We are having a great Christmas day, ate turkey and Christmas pud until we were stuffed!! opened our pressies (my Secret Santa tat exchange presents are just perfect) and now are playing board games....wonder how you all spend your Christmas Day. We went for our walk to the Christmas swim BUT the weather had taken a turn for the worst and the wind was coming from the east, seemed like direct from Siberia. It was very cold just watching, I can't even imagine what it must have been like going into the water a even worse coming out again into the chill wind. 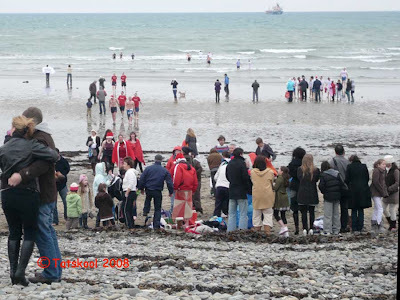 My very favorite thing to do at Christmas is to go and watch the Christmas swim on Christmas morning. 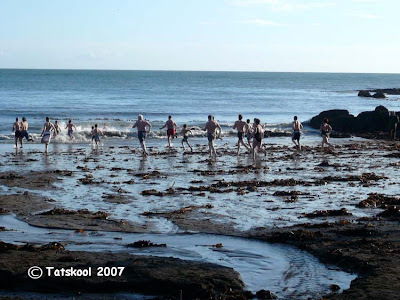 There is something very exhilarating about watching dozens and dozens of hardy people rushing into the very cold sea while we stand all wrapped up in the cold,cold air. This is just a taster, just a few of them. Lots of them go in in their Santa hats and come out to hot drinks and hot water bottles and blankets. Brrrrr!!! This was last year and what a beautiful day it was. We are promised dry cold weather so far so fingers crossed for a good swim! 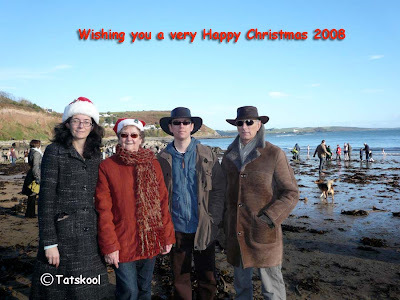 Here is my Christmas card to you....the photo is also from last Christmas...this Christmas day our daughter will spend in her own home for the very first time with hubby and baby Fionn. Our son has already arrived with his partner and a car full of games. 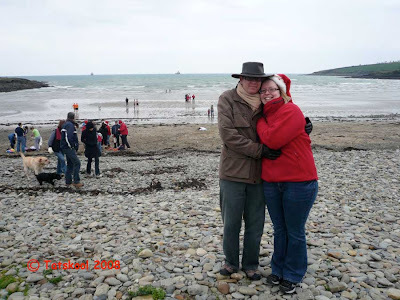 We hope to see baby Fionn and family after Christmas. 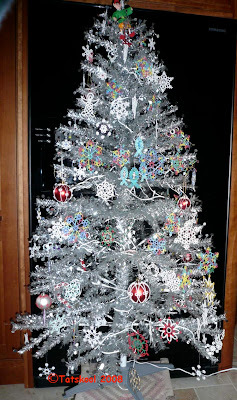 I promised you some more pictures of my Silver Disc tree...very difficult to get good photos. 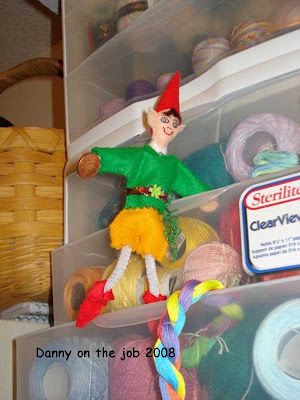 I finally stood it in front of my black fridge, so here goes... Fergal the Leprechaun decided that he stand at the top. ...and just one taster to show you how much is loaded on to it. 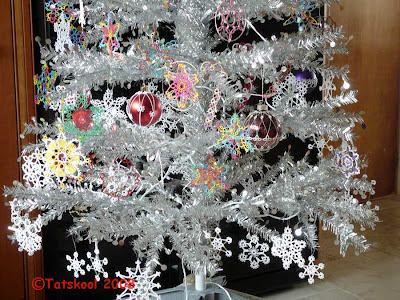 On my tree as well as zillions of items tatted by me are snowflakes, angels and icicles tatted for me by.....Jeanne H, Mary O'D, Jane Eb, Sally Ker, Gina Br, and Laura B.
I hope to have a things from a lot more tatters next year!!! 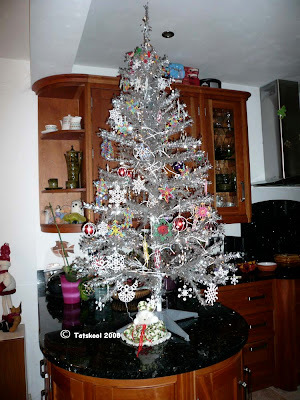 Next time I will show you some of the other snowflakes on my tree from past years. Here it is the last one from Jon's book....Radiance and it has to be one of my favorites. 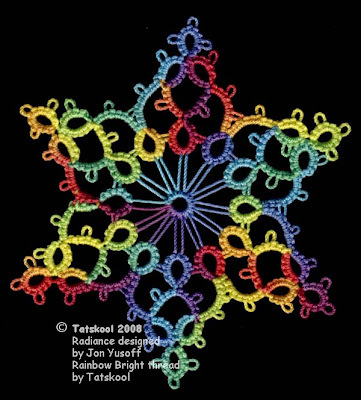 By the time I got to Tatting it in Rainbow I had realised that Jon had tatted the central ring and showed the wrong side...maybe for a reason as it looked so much nicer that my white one with right side showing. This one looks BEAUTIFUL. The long picots in the middle really set off the puter round. Well that's that...I did it. This is the first time I have ever tatted my way through an entire book, let alone tat an entire book in the same colours. What an experience it has been and it's hard to pick out my favorites. If they weren't all on my tree I would lay them all out together and photograph them...maybe after the New Year. Favorites...Radiance, Carrousel, Oasis. Sweet Rose, Circle of Crowns,Sunburst, Milky way, Aladdin. 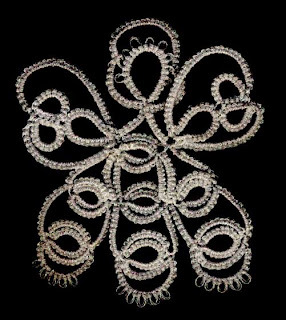 Conclusion....Jon's book Snowflakes Collection,is well worth buying. No 14. Pirouette and a party! and another flake. 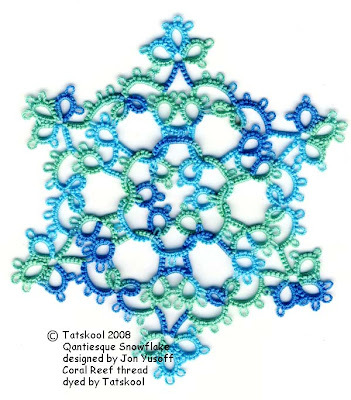 My penultimate snowflake from Jon's book is Pirouette. 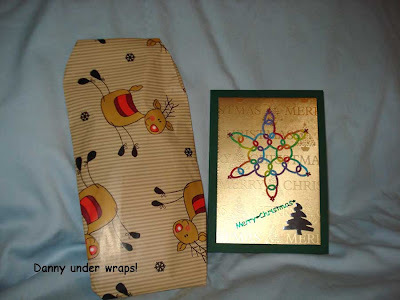 A picture on blogger gives no indication of size, unless you put an object in to show the scale. So what you can't see is that I tatted the white one in size 20 and it's big! It measures 3 3/4 inches(9cm), I tatted it again in Rainbow in size 60 and that measures 2 3/4inches (7cm) and looks so different. 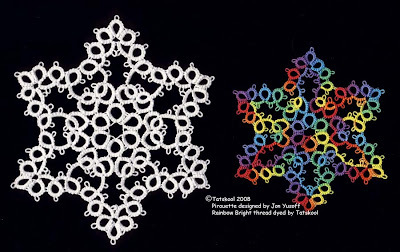 I didn't really like the big white one much but when I tatted it in 60 and in Rainbow it suddenly came to life, the colour seemed to be concentrated in the finer thread...maybe I should do a white one in fine thread! 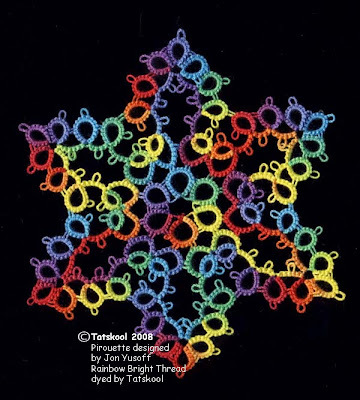 Remember I showed you the one that Snowy tatted in Rainbow in 80 and the colour was a perfect repeat for each point...well not so in 60 as expected. Size 20. Round 1, Sh 1.6 metres. Round 2, Sh1, 6.75metres, Sh2, 2.7 metres. Remember you may need more!! It would look really nice with the centre in a different colour. OH!! did I promise you a party!!! 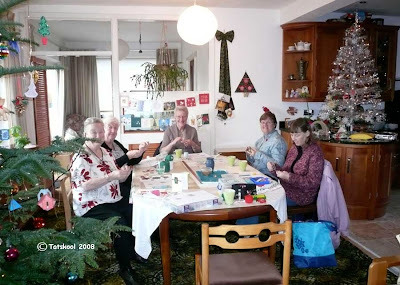 Thursday was the annual Christmas Tat party for me and my friends. 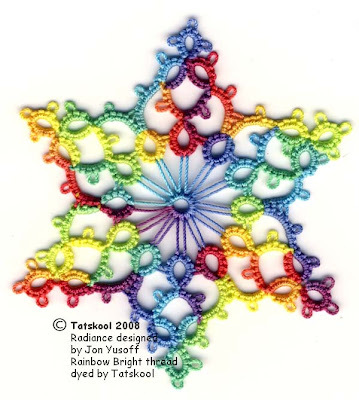 The best group of tatting friends anyone could wish for. QantiesqueWe tatted all morning...they all have Jon's Snowflake book and have been working hard on them so today was treat day and we tatted Jon's 'Quantiesque' Snowflake which they absolutely loved. Coral Reef 40 was a favorite and also Altin Basak in lovely varig' pale blues and we also have one in white with red beads. 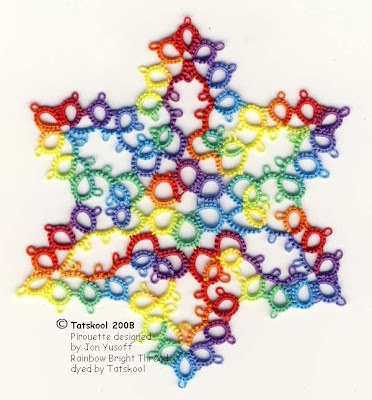 My tatting Christmas tree came downstairs to be the star....photos of that to come another day. 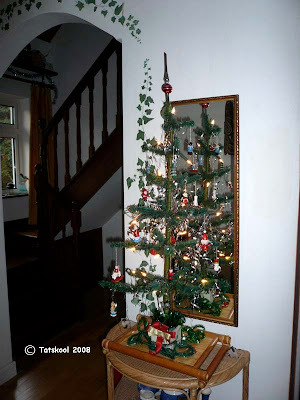 No tatting on my real tree at all this year (though a lot of the ornaments were made my me in years past and are still my favorites)and my antique feather tree (that I showed you before) that usually has my tatting now has all little wooden toy ornaments this year. It looks soooh very different. My teeny tiny tree didn't make it out of the attic!! My table was stretched to its largest as they all bring lovely stuff to eat for our Christmas party...hubby made divine butternut squash and coconut soup for starters...we were very happy tatters and not a hint of chocolate in sight! 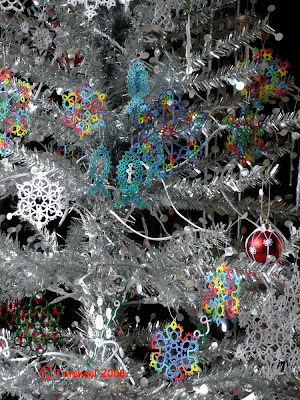 Oh well since you asked this is a photo of my Silver Disc Tree, it's groaning under all that tatting. 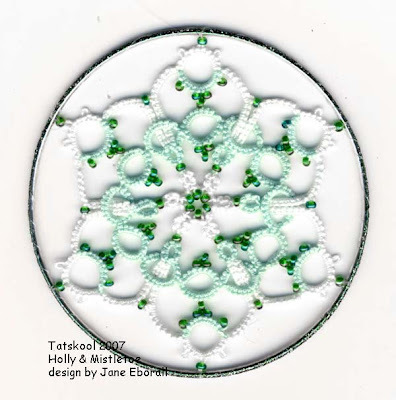 I will show some close ups and maybe some of the pieces you haven't seen before another day. I tried to count them but had to give up. well you knew I would tat it in white didn't you!! 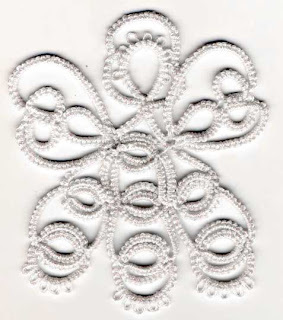 white has that special snowflake crispness that you just can't beat....and you really see what the negative spaces look like. This is in size 20. 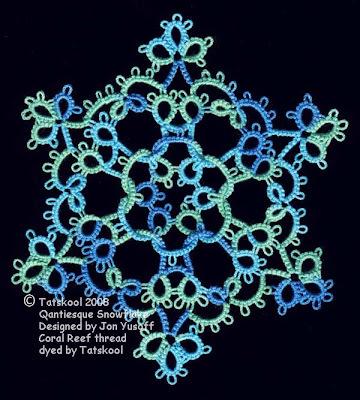 When I saw Jon's pattern I had just unwound a skein of Coral reef in size 40 which is what she used so of course I had to tat it in that. 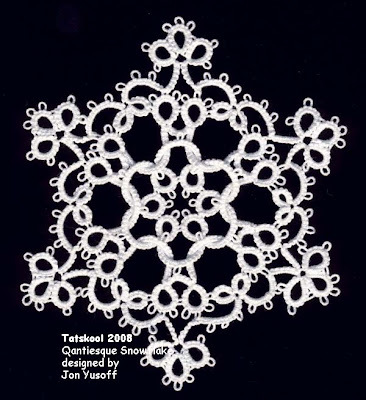 Only one more of Jon's Snowflakes to go. 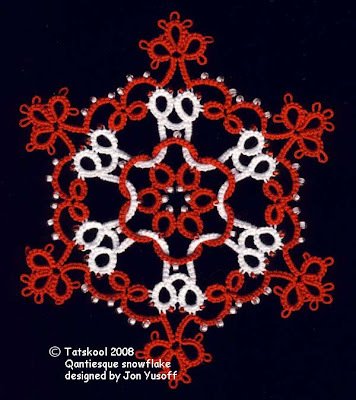 No 10, Sweet Rose and How I Stiffen My Tatting..
No 9. 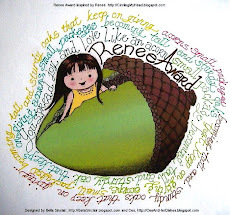 Floret, a tree and a Lep update!